Is Thyroid Disease Really That Funny? Lately, it seems like physical problems, disabilities, and even that old comedic standby — jokes about being overweight — are off limits for mainstream humor. But as society has moved away from making fun of people with health challenges or physical issues, it seems like thyroid problems have become a catchall target for jokes and comedians. I have a theory about why this is: A lack of push-back. Comedians and jokesters have always loved to poke fun at people who are overweight. But as sentiments have shifted away from fat-shaming, there’s a workaround that is increasingly popular: the thyroid joke. The implication is, of course, that the woman in the sweatshirt is overweight, and the “guess” is that she has a thyroid problem. Somehow, by using thyroid problem as a “code” for overweight, the joke is deemed acceptable and even funny by many people on Twitter. Advertisers have also gotten in on the action. An ad from Marriott Hotels featured a business traveler, sitting in a middle seat on an airplane, with a very overweight person sitting on the aisle. The voiceover touted the comfort of going to your Marriott hotel after a long day traveling while “stuck in the middle seat next to someone with a ‘thyroid problem.’” Another clear use of the “thyroid-equals-fat” code language. Comedians, advertisers, and internet meme-makers know that if they fat-shame or make fun of people who are overweight, they will experience strong push-back. But they can make the same point using the “thyroid code” and get away with it, because there is little organized media advocacy for thyroid patients. 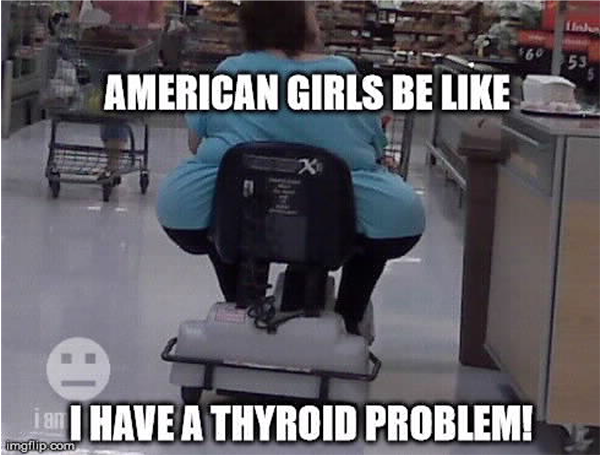 Sadly, professional groups like the American Thyroid Association have never taken a stand against advertising or humor that denigrates people with thyroid disease. The end result? There is no downside to making fun of thyroid patients in the media. 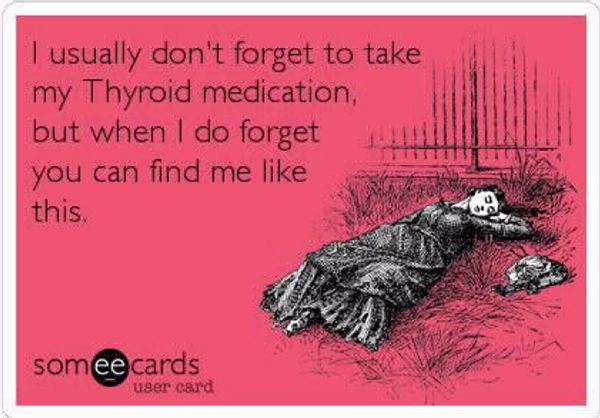 The ThyroidNation site has a good piece on finding the humor in Graves’ disease, the site DearThyroid is dedicated to humorous letters to the thyroid, and the Thyroid Cancer Survivor’s Association (ThyCa) has a humor page, including poems and song lyrics. These sources use humor to bring laughter and levity to those who live with a serious illness, instead of simply poking fun at them. Surprisingly, a comedy show did the best job of effectively highlighting the struggle of dealing with chronic illness. She is sent to another doctor, the smug and condescending Dr. Budd, who tells her that she is just getting old, and she should see a hairdresser to dye her hair, and implies that it’s all in her head — a situation all too familiar for many women with thyroid disease. Dorothy finally sees a doctor who diagnoses her with Chronic Fatigue Syndrome (CFS), another frequently overlooked health condition that, like thyroid disease, primarily affects women and is often misdiagnosed. Dr. Budd, I came to you sick and scared, and you dismissed me. Instead of saying ‘I’m sorry, I don't know what's wrong with you,’ you made me feel like a child, a fool, a neurotic who was wasting your precious time. Is that your caring profession? Is that healing? It’s no surprise that Golden Girls got it right. The episode was written by the show’s creator, Susan Harris, who herself had CFS and struggled to get properly diagnosed. Over the years, many thyroid patients have told me that they laughed, cried, or cheered when viewing that episode, as they could relate all too well to being dismissed by patronizing doctors over the years. Given the tendency for writers to use thyroid patients to make not-so-subtle fat jokes or insults, thyroid patients face two choices: Laugh it off and refuse to be insulted, or push back and call on writers and advertisers to put an end to the “thyroid code.” There are pros and cons to each approach, and only you can decide how you want to respond.